When it comes to pimples, it can be quite difficult to resist the urge of popping them, especially the ones around your face. But the fact remains that there is a part of your face you should never touch a pimple. While popping a pimple is not the ideal way to treat the blemish, there is a time for pimple popping. It requires patience and if you do it too soon, you will be left with a more irritated skin, which is exactly what you want to avoid. But no matter the timing, experts are of the opinion that there is one area you should try as much as possible to avoid when it comes to eradicating acne by popping. 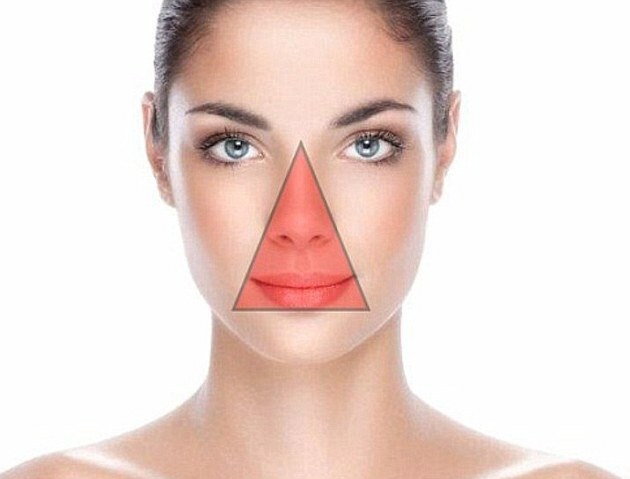 Be mindful never pop a pimple in the area known as the “danger triangle,” a region which reaches from the corners of your mouth to the bridge of your nose. The reason experts believe you should avoid popping a pimple in this region is because of the high infection risk, which is significantly higher in this area due to a concentration of veins which lead back to the cavernous sinus region of your brain. In the case of an infection resulting from a popped pimple in this region, antibiotics treatment is recommended, so if you suspect you may be developing one, there is no reason to fret. The signs of infection to look out for include redness, swelling, drainage, bleeding, and continued development of pus. On the other hand, if you notice that any of these symptoms persist, seek medical attention as soon as possible. Also know that a good way for you to keep your skin clear is to avoid certain foods and change your bedding regularly.